We started Advanced Web Ranking 15 years ago. Back in 2003 there wasn’t a good solution to track search engine rankings, so the desktop application that we launched back then had an instant success. We discovered a great community of like-minded people, and with their help, we created a tool that people relied upon for their everyday SEO needs. Ten years later, many things had changed. In 2013, people needed access to their ranking data remotely. Plus, they were no longer willing to spend their time tracking the data, but rather analyzing instant results. That’s the reason why we built AWR Cloud. And it changed everything. Fast forward to 2018, things have changed again. Complexity is no longer valued. Simple and powerful are now the most important things. People want apps that solve their problems in the easiest way possible. They want apps that are fast and a pure joy to use, apps that are scalable and can grow with their increasing needs. So about four and a half years after we first launched AWR Cloud, it’s time we reinvent ourselves again, by creating a better AWR. Only this time we’re focusing on the core of our business: rank tracking. Over the last months, our product and engineering teams have been focusing their entire attention on rebuilding the user interface from scratch. The new AWR lays the foundation for the future of our platform, is remarkably fast and easy to use, and redefines reporting for SEO agencies. It’s a truly UX vision that delivers a unified and consistent user experience throughout the platform. We call it simply Advanced Web Ranking or AWR. The new version has been redesigned completely with speed and usability in mind. It employs the latest web technologies for a smooth and user friendly experience. The rankings are now front and center. The reports help you get true insights about your keywords and search results. The tool no longer feels like it’s been built by technical people for technical people. It’s been rebuilt from scratch for marketers. SEO marketers. You’ve always wanted to be able to create custom reports that show only the data you needed. Well, now you can. Because you can now build your dream reports with just the widgets you need, in a simple and very easy to use WYSIWYG editor. And you know what the best thing about the new reports is? They are live, updated in real time. This means you’re no longer looking at an outdated, read only report. Now you get to see the data in real time and select the date range you need. It’s like you can design your very own AWR the way you need it. And all this thanks to the powerful and scalable new API that the application is centered around, that will allow us to improve the platform for years to come. Since we’re now focusing exclusively on rank tracking, the application menu has been completely redesigned around it. We removed the Links and Social sections, but we kept the ability to connect your Google Analytics and Google Search Console accounts to get official data from Google in your reports. What if I’m not ready to switch yet? Change is hard for most of us. Imposing change on other people is even harder. That’s why we decided to keep the current version of AWR Cloud for all existing customers and offer the new version as an option. This means that you will still be able to use the current AWR Cloud for as long as you want and we’ll make sure you will get the same great service you received from us so far. The good news is that all existing customers will get free access to the new version. And since both versions share the same backend infrastructure, you can access your ranking data in both versions at the same time. This way, you can decide which one is best for your needs, at your own pace. We’re releasing the new AWR in beta today. But this is just the beginning. It’s the foundation for the future of our platform and we’ll be constantly adding new things to it. We’re building this for you and the most important goal for this redesign was to make it easier to solve your day to day SEO needs. So why not give it a try now and let us know what you think? Thanks for all your feedback along the way. We’re always listening and we’ve built plenty of it into the redesign. Reports seem interesting, concept also interesting. but i hope it will improve even more. Thanks Wouter. I’m happy to hear you like it. The BETA looks and feels great, I love the new reports and the ability to build reports from scratch. I miss the GWT section with GA as we used that a lot, also the crawler and links sections aren’t easy to find or missing from the new AWR Beta. I hope they will be included and the links improved, I’d love to just use AWR for link tracking and ranking rather than having to switch to other platforms just to monitor links in more depth. We’re focusing all our efforts on rank tracking this time, so there will be no links and crawler in this new version. However, GWT and GA data is important for rank tracking and is currently available in most of the reports as additional columns. This is exciting news. We tried AWR Cloud twice and hated it…both times…so we’ve stuck with our old unsupported Desktop version of AWR. It’s buggy and doesn’t play nice with High Sierra but at least it gives us ranking data and competition data when we need it…for the most part. Will this new version of AWR work on a Mac with High Sierra? Will it have the Competition report? Will we still need a Big G proxy so we can process ranking data for 10K-20K phrases at a time? This new version works in browsers, such as Safari, Chrome or Mozilla. It should work just fine on your Mac with High Sierra. There is no need to get a proxy server because we handle that for you, regardless of keyword volume. Thanks Joel. Let me know what you think. Love the new stuff for sure. Ran into a couple of issues that I either don’t understand what I am doing or they are bugs. 1) I cannot delete a section of a report. It just lets me click and does nothing. (Chrome and Firefox). 2) I would love a way to dictate the sort order on keyword reporting by default on a report (like sort from #1 and down). It also will only allow 100 keywords per report – on larger clients with multiple business units we run 200-300 keywords to check. PS. The problem with deleting a section of a report should be fixed now. Until now and as a professional graphic designer, SEO and GUI builder I am not happy with the redesign. The color-scheme hurts the eye and everything apears more chaotic where the design was quite good before. Even sizes and spaces are not fitting each other. You can see “additional infos” displayed enormous big in the dashboard (Shared with…, PD, SE, KW). The color blue appears in different kinds (especially in the typo, where it hurts the eye), main menu-bullets are nearly as big as their child-bullets. I know that one has to “learn” a new GUI and has to go to a process of addiction but this will not work, if the redesign keeps going that way. Thanks for the feedback, Sascha. I will pass it on to our design team. Thank you for your reply, Philip. Can you please help me finding and get back the graphs? 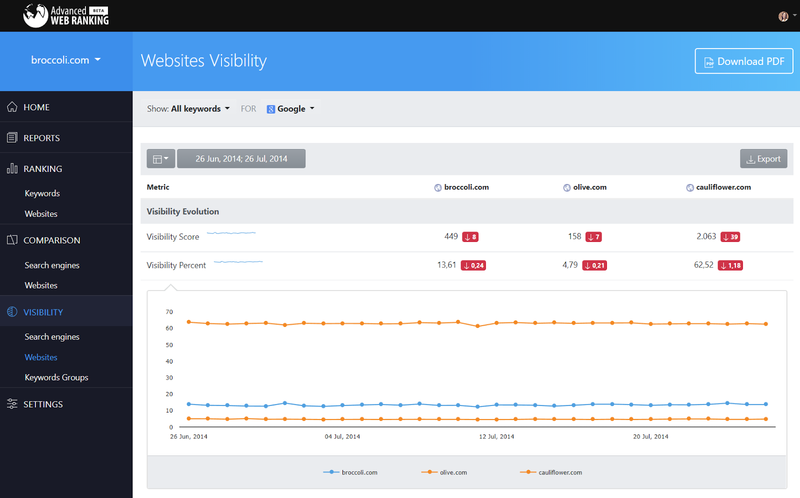 In your Screenshot I can see the comparison-chart for “Visibility > Websites” but not in my account. … most of all I miss the possibility for long-term considerations, as the date-range seems to be shortened to a 3 month period. In all menus, please click the visibility metric/keyword/website you wish to see the graph for, and it will expand right below, in the same table. As for dates, you can still select larger periods of time to compare, but you need to select the beginning and ending dates of the interval you are interested in from the calendar. Thank you very much. I try to dive deeper into the date range asap and get back to you with my experiences. What I am still missing is the direct overview-graph comparing my domain and selected competitors over a date-range. And the column for rises/losses in the dashboard- and ranking-view. > As for dates, you can still select larger periods of time to compare, but you need to select the beginning and ending dates of the interval you are interested in from the calendar. Please offer a date-field for a specific and wider date-range. For me it feels like a pita to have to scroll the calendar. That said, even the previous selection for “from beginning” range would be cool. I just downloaded the free trial and was pleasantly surprised by the existing grey and faded red scheme. Already very large and bold on a 25inch WQHD 2560X1440, but still nice. I briefly switched to the Beta – and found the new color choices quite a change to the worse, in particular that large, saturated block of blue(s) but also the dark tones are too way too strong, with too much contrast. I totally understand the need for responsive Design and certain compromises caused by this challenge. What I see on my large screens is utter waste of screen estate though. The Menu strip on the left is three times broader than its text, the blue (unnecessarily doubled) title bar is enormous and again three times the height of the contained text. In an analysis tool I personally want columns of data to consume my 90% of my screen estate, titles and navigation should be a lot more modest. At this point in time I find the GUI way better solved in the “old” version. And man, back to grey and friendly, faded red, what a relief. Thanks a lot for your feedback, Sascha. We’ll keep your preferences in mind for further improvements on date selection and calendar. Also thanks for letting us know that the Change column is important to you. At the moment this column is not implemented into the new version, you can only see rises and losses next to each keyword Position. The graph overview I think you are referring to, can still be accessed from Ranking menu -> Websites. Select the websites/competitors you wish to compare and choose “Compare in chart” from the Manage drop-down at the top of the table. A dialog should appear with your websites’ performance compared over the period of time selected. Sounds like a good solution for us. Does a trial version exist? I’m having trouble finding the “Top Sites” report that was available in previous versions. Has it been removed? if not can someone point me in the right direction. While in Ranking > Keywords, click on any keyword in the table to expand the corresponding chart. At the top of the chart you will also find a link to the associated “Top Sites” list. Will the CSV version of the Top Sites report be in the final update? If not is there another feature that allows me to see competitors that are ranking for my Keywords w/o manually updating my competitors? The “Top Sites” report was pretty important to my work, I’d be sad to see it go. At the moment, in the new Beta, there isn’t available a feature that would replace the TopSites export. But no worries, there will be lots of additions to the new version as we progress towards its full release, and TopSites export/improvements are definitely on our list.